The PLAAF J-11 fighter flying near the U.S. Navy P-8 Poseidon. Last week, a Peoples Liberation Army Air Force (PLAAF) J-11 fighter aircraft intercepted a United States Navy P-8A aircraft over the South China Sea, at one point coming within 30 feet of the P-8A while making sharp maneuvers and crossing the P-8A’s flight path. According to statements by officials at the U.S. Department of Defense and the White House, both aircraft were operating more than 100 nautical miles from the Chinese coast at the time of the intercept. The U.S. formally protested the intercept as dangerous and unprofessional. China responded to the demarche on Saturday, disputing that its aircraft was as close as the U.S. claimed. 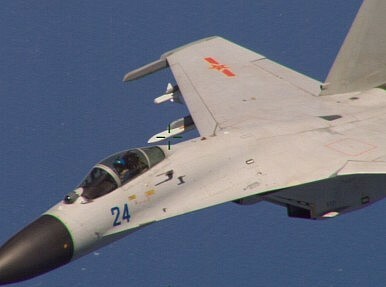 This type of harassment and intimidation by the PLAAF has become common in the skies over the South China and East China Seas. In 2001, a PLAAF J-8 collided with a U.S. Navy EP-3, causing the EP-3 to make an emergency landing and the J-8 to crash into the sea. In May and June, Japan protested dangerous intercepts of military aircraft by PLAAF fighters over the East China Sea. Additionally, U.S. officials indicated that this was the second protest lodged with China since May, the previous one issued in regards to similarly aggressive intercepts that have occurred within the last six months. The message being delivered by the U.S. following this incident is an important one. The U.S. did not object to the intercept itself, but rather to the manner in which it was conducted. This sets an important example of consistency for China and others and reinforces the U.S. commitment to two important issues in the maritime domain, safety of flight and freedom of navigation. Fundamentally, this was an issue of safety and it is helpful to evaluate the PLAAF fighter’s 30 feet of separation vis-à-vis the standards for safe operation of intercepting aircraft. Article 3 of the Chicago Convention requires that state aircraft (a term that includes military aircraft) operate with “due regard” for the safety of navigation of others and this applies to aircraft conducting intercepts. While “due regard” is not defined in the Convention and is a matter of situational judgment, U.S. practice is instructive as to how it has been interpreted by one of the leading authorities in aviation. Regulations of the U.S. Federal Aviation Administration (FAA) state that “flight operations in accordance with the options of “due regard” or “operational” obligates the authorized state aircraft commander to separate his/her aircraft from all other air traffic.” FAA regulations set the threshold for safe aircraft separations at 500 feet, defining a Near Mid-Air Collision (NMAC) as an incident in which the possibility for a collision existed as a result of two aircraft not maintaining that minimum separation. More specifically, the Rules of the Air, Annex 2 to the Chicago Convention, advise states to operate with caution when executing intercepts. While these standards apply only to the intercept of civil aircraft, the concerns they illustrate are nonetheless relevant in the context of state aircraft. The Rules of the Air acknowledge the inherently hazardous nature of intercepts, emphasizing that interceptors must operate with due regard, avoiding “flying in such proximity to the intercepted aircraft that a collision hazard may be created” and avoiding crossing an aircraft’s flight path. Weighed against these standards, it should not come as a surprise that the U.S. would interpret “barrel rolls” by a fighter aircraft in close proximity to a larger and less maneuverable aircraft to be hazardous and unprofessional. The U.S. response objectively seeks to protect its aircrew and aircraft from these sorts of risks, while not denying China the right to conduct safe intercepts just as the U.S. does. The protest from the U.S. is also a clear expression of the political reality that the U.S. will not be dissuaded from its exercise of high seas freedoms, while reinforcing that states seeking to build close military-military ties with the U.S. are expected to respect those freedoms and conduct themselves honestly in doing so. Saturday’s response from the Chinese Defense Ministry argued that “it is [America’s] massive and frequent close-in surveillance of China that endangers the two sides’ air and marine security, and is the root of accidents.” Not only is this statement inaccurate in alleging that U.S. military aircraft have caused accidents over the South China Sea or pose a risk to international aviation, it also repeats the often advanced and incorrect position that military activities in the Exclusive Economic Zone (EEZ) are unlawful. It’s hard to ignore the irony of the Chinese argument challenging the exercise of the freedom of navigation by surveillance craft in international waters or airspace, an irony previously discussed in The Diplomat. Less than two months ago, the People’s Liberation Army Navy (PLAN) operated a military surveillance ship within the U.S. EEZ off Hawaii during the Rim of the Pacific (RIMPAC) bi-annual exercise hosted by the U.S.. The U.S. did not chase the ship from its EEZ or harass it with unprofessional maneuvers as it was operating in international waters. Rather, the U.S. accepted the politically consistent position that states which exercise high seas freedoms when conducting military activities must be especially willing to respect those freedoms when exercised by foreign militaries. This position is responsible and promotes predictability as there is no gap between U.S. adherence to international law whether in its own EEZ or that of another nation. Unfortunately, China’s adherence to international law continues to be unpredictable and its response to the U.S. protest exposes the reality of its intercepts. If there is no question as to the identity or intentions of these surveillance aircraft and their presence is as routine and predictable as China suggests, the only logical conclusion is that China’s objective in its unreasonably close intercepts is the interference with the freedom of navigation in international airspace. The U.S. has taken the important step of publicly confronting China on this important issue for, as last week demonstrated, China’s continued assertion of excessive authority over international airspace threatens not only the rule of law on and above the high seas but also the safety of those operating there. Ryan Santicola is a judge advocate in the U.S. Navy. The views expressed in this article are the author’s own and do not necessarily reflect those of the U.S. Government, the Department of Defense, or the Department of the Navy.